What girl doesn't want to be surrounded by gorgeous jocks day in and day out? Jordan Woods isn't just surrounded by hot guys, though–she leads them as the captain and quarterback of her high school football team. They all see her as one of the guys and that's just fine. As long as she gets her athletic scholarship to a powerhouse university. "A beautiful novel with a real and captivating depiction of high school relationships, Catching Jordan shows the same reverence for the human heart that it does for the game of football." ―Karsten Knight, author of Wildefire. Football and young adult romance. That pretty much sums up Catching Jordan. There's no playbook for love. I once read that football was invented so people wouldn't notice that summer was ending. The premise of plot had me at "Hello." Jordan is a kickass female quarterback who falls in love for the first time. As a reader who grew up playing sports, I loved the premise of the story. Especially the twist that Jordan must compete against the guy she is falling for, for the same position on their football team. Catching Jordan's pacing was ideal for the plot-line. It did not feel out of touch with the progress of the story. The story explored being a tomboy, first love, best friend to love transition, coming of age and so on. Moreover, the writing was not exceptional but it was enjoyable enough. All in all, Catching Jordan is a sporty, girl power summer read. I enjoyed it. Catching Jordan is perfect for girls/woman who have never felt like they fit into the mainstream girly girl construct. I may not have loved it but definitely recommend it to any reader who can relate to theme. Moreover, I would also be willing to read more works by Miranda Kenneally. Jordan Woods - Her character was very relatable for me since sports was a huge part of my identity growing up. I knew what it was like to struggle between wanted to be taken seriously for my skills on the court or on the field while at the same time trying to be feminine enough to attract my crush. Additionally, Jordan is a strong, respectable leader to be admired as well as endearingly human, with the difficulty dealing with emotional situations -- traits I great relate to. 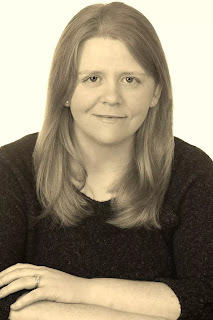 Miranda Kenneally enjoys reading and writing young adult literature, and loves Star Trek, music, sports, Mexican food, Twitter, coffee, and her husband. She is from Tennessee but now lives and works in Washington, D.C.